I read this article and found it very interesting, thought it might be something for you. The article is called 988 Mn Indians Do Not Have Life Insurance. Those Who Do, Are Insured For 7.8% Of What’s Needed To Cover Financial Shock https://www.indiaspend.com/988-mn-indians-do-not-have-life-insurance-those-who-do-are-insured-for-7-8-of-whats-needed-to-cover-financial-shock/. Chennai: At least 988 million Indians--more than the population of Europe and 75% of all Indians--are not covered by any form of life insurance, and an Indian is assured of only 8% of what may be required to protect a family from financial shock following the death of an earning member, according to our analysis of government data and industry data. With 82% of India's workforce engaged in informal employment in the unorganised sector, 392.31 million workers and their families--more than the population of United States--live under constant threat of financial setbacks due to insufficient or non-existent coverage. India had about 328 million life insurance policies in 2017, according to data from the Handbook on Indian Insurance Statistics, 2016-17, of the Insurance Regulatory and Development Authority of India (IRDAI). Assuming each policy corresponds to a unique citizen, this accounts for 25% of the population having life insurance cover, leaving 75%--or 988 million Indians--without cover. Further, an average working person is assured of, as we said, only 8% of what may be required to protect a family after the death of an earning member, according to our analysis of data by leading global reinsurer Swiss Re. This is much lower than the insurance coverage adequacy of 44% in Japan, 84% in Taiwan and 67% in Australia. 1. Annual premium growth: India’s total real premium growth rate for life insurance--the annual rate of increase in premium collected by the life insurance industry in real terms i.e. adjusted for inflation--is 8%, according to the IRDAI’s 2017 annual report. While this is better than Brazil’s 1.2%, it is lower than Russia’s 48.2% and China’s 21.1%, data show. India’s life insurance density (adjusted for purchasing power parity) was $811.3 in 2016--ahead of Brazil ($390) and China ($659.7) but below the UK ($2,129.3), USA ($1,724.9) and South Africa ($2,611.7, according to data from the IRDAI Annual Report, 2017. India’s life insurance penetration was 2.72% in 2016--comparable to Brazil (2.28%), China (2.34%) and the US (3.02%), but lower than South Africa (11.52%) and the world average (3.47%). Personal accident insurance usually covers death or disability caused due to an accident. As of 2017, 65% Indians are covered by personal accident insurance, according to data from the IRDAI’s 2017 annual report. Over 20% of PMJDY beneficiaries haven’t even been issued RuPay cards, PMJDY data from December 2016 show. Further, 48% of people holding an account with a financial institution--banks, credit unions, microfinance institutions, cooperatives and post offices--have neither deposited nor withdrawn in the past year, according to the 2017 Global Findex released by the World Bank. 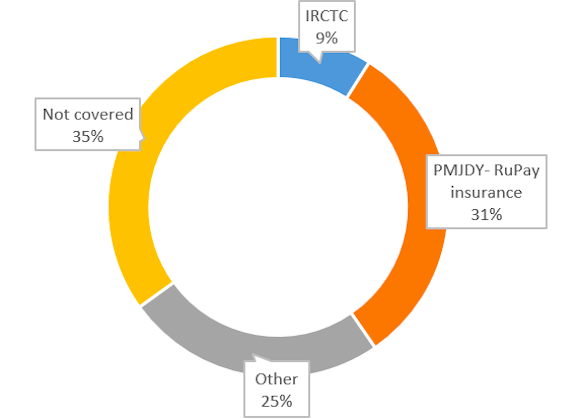 If we exclude PMJDY and IRCTC schemes, the personal accident coverage of the country’s population reduces to 25%. The total sum assured accounts for 58% of India's GDP, according to this 2013 RBI report. This is more than that of China (33%) and Indonesia (28%) but much behind the US, Germany, South Korea and Japan where it is in the range of 105%-321%, illustrating the poor quality of cover in India. As of March 2017, the sum assured to GDP for life insurance in India is 65%, according to our analysis of data from the IRDAI’s 2017 annual report and the handbook mentioned above. India has the highest protection margin in the Asia Pacific region at 92.2%. This means having savings and insurance of just Rs 7.8 for every Rs 100 needed for protection, leaving a protection gap of Rs 92.2. Further, India’s mortality protection gap rose 11% every year, on average, over the past decade, data show. For instance, of the 21 life insurance plans offered by India’s Life Insurance Corporation (LIC), the largest player in India’s life insurance market with 70% market share, only three are pure protection products. To tackle the issues of awareness and underinsurance, the central and state governments have come out with schemes for risk protection, especially for the socially and economically vulnerable sections of the population. But these schemes are falling short of their objective of providing adequate risk protection for low-income households, as is reflected in our analysis. Article draws attention to inadequately insured Indians that warrants urgent intervention of the government. Good thought-provoking research paper. Hope the government pays heed to it. A well-prepared informative write up. All the best to the writer. Well thought-out and systematically presented research paper. A lot of effort has been made to collect scarce data. This will certainly help readers understand intricate matters of life insurance in an easy manner. What needs to done in this field is also emphasised. Very detailed, insightful and systematic piece of writing.